When I first started building sites using WordPress, I downloaded a few different themes and took pieces from each to build the sites my clients wanted. Each theme had its own peculiar way of implementing things and, of course, with each new theme used I spent precious time learning that particular theme developer implemented their features. In the summer of 2012, I learned about StudioPress. I read their blog and searched for sites that were using their themes. I was impressed with the diversity of the sites built with the StudioPress Framework. I purchased the framework within the next few months and have been very happy. The support forum is moderated very well providing answers to questions about particular themes and advise on how to implement your own features. I found the third party developer community is quite active and, therefore, I am able to find plugins coded specifically for the StudioPress Framework to bring advanced functionality to my sites. Ease Of Use – StudioPress provides full instructions on how to configure any one of their themes to look exactly as the theme is demonstrated on their website. Developers Are Not Required – The framework and theme can easily be uploaded to your site via the WordPress Admin Dashboard. When a new release of the framework or theme is published, you will be notified via the dashboard and updating the framework and theme is as easy as clicking the Update button. Responsive Design – If you want your visitors and customers to be able to access and read your site using a smartphone, tablet or desktop, you want your site to be responsive. StudioPress themes are responsive right out of the box. No additional configuration necessary. Search Engine Optimization (SEO) – Afraid of all those SEO plugins available for WordPress? No worries, the StudioPress themes are fully optimized and they support the Schema.org code, which allows you to output microdata in your site’s code. This enhances your site’s search engine optimization even further. Click here to read more about the Schema.org code. Unlimited Use – There are many theme developers that sell you a theme and restrict its use to just one site requiring you to make multiple purchases for each site you would like to install it on. Not with StudioPress, purchase the theme and framework and you can install it on as many sites as you require. How cool is that! Developers Can Be Helpful – While you can install the Genesis Framework and child theme without needing a developer, should you have a very customized site in mind by all means contact us and let us know what you have in mind. This list is just a brief list of the Genesis Features. Click here for a complete list of Genesis Framework features. Also, take a look at the Showcase of Sites where you will see what some people have done with their site design projects. Do yourself a favor and take a look at the StudioPress Genesis Framework – there’s a good reason why many of the Internet Notables are using StudioPress. 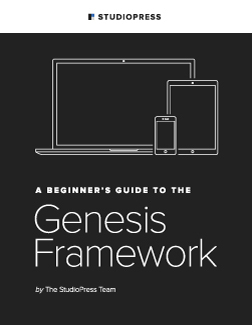 If you are worried that the Genesis Framework is too advanced for you, go ahead and click on the image to the right to download your FREE Genesis Guide for Absolute Beginners. After reading it, you’ll see just how easy it is to install and configure a Genesis Theme.